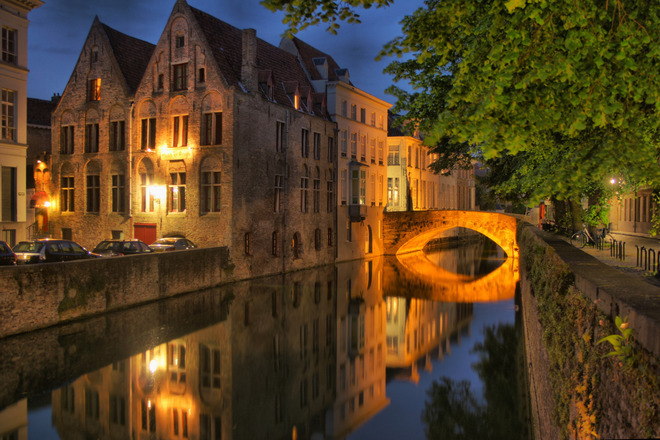 But Bruges stole my heart and swept me back to a time and place I couldn’t imagine existed. With the romantic canals that wash through Venice, the Eiffel tower that sparkles in the Parisian night, the sapphire blue waters of the Mediterranean and the crisp flowery air of the Austrian Alps, most people seem to forget about the little country of Belgium, and its cities seem to fall in the shadows of other more prominent places. 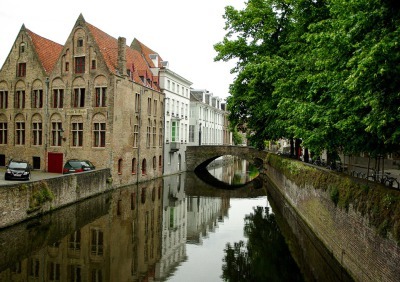 But Bruges stole my heart and swept me back to a time and place I couldn’t imagine existed. The train from Brussels took me across the country, and I passed fields of red and yellow Tulips, Dutch farms with little old mills and palomino horses. The train I was on could have used a little more love, rusted on the outside, dated on the inside, but the experience made me feel like I was in an old movie. 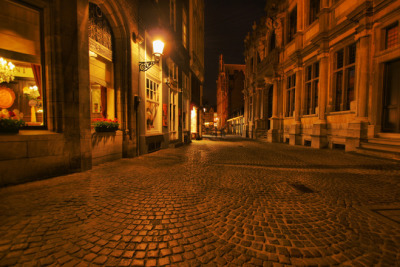 I was on my own and had plenty of time to think, but I couldn’t seem to gather my thoughts enough to form an idea of what Bruges might be like, so I contented myself with the feeling of anticipation and the smell of spring air blowing gently in from my compartment window. When the train finally arrived, the sun was bright and the sky was a clear pastel blue. Everything about the train station was modern. Floor to ceiling glass windows, which brightened the station and framed the glimmering leaves of giant Oaks. Down the steps and across the courtyard I arrived at a long straight road, immaculately clean with asphalt recently laid and road markers freshly painted. 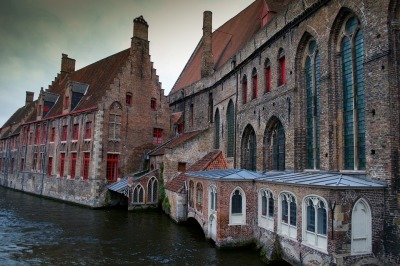 It seemed impossible that this could be the location of the ancient and medieval city of Bruges. I must admit that for a moment I was a little disappointed. So headed across the road to a kind of park on the other side. I decided it couldn’t hurt to sit and gather my thoughts, especially as midday was in full bloom. At first, I wasn’t sure if I was walking straight into the woods. The trees were old, very old, and the roots that sprung up at the bottom seemed to tangle themselves between each other. The foliage above was thick and green, with mottled patterns of sunshine bursting through that gave the grass below a peculiar decoration. I could spot snowdrops and crocuses bursting up through the ground, and here and there were tufts of clovers. Through the tangle of trees, I could see a place where the ground sloped and led to a river. I walked towards it, careful not to step on any of the spring flowers. The canal was very old, and the banks had branches of weeping willows gently touching the water. Small hedges of white and purple flowers littered every inch of free space. The water itself hosted its own life, with elegant white pond lilies floating on the surface. The canal seemed to wrap around a street, so I walked along the river to find a bridge. When I managed to cross the canal, I could see an ancient stone wall that nature had mostly taken over. Vines of flowers, creeping ivy and branches of trees hugged the wall and was touched with mosses and lichen. It was all so densely covered by greenery, that I couldn’t see anything on the either side. I felt like I had found a great secret. Something lonely and forgotten. I gently dragged my hand across the wall and walked for a long time, using the old wall as a guide. I could hear the sound of a hundred ringing bells from inside the wall. I quickened my pace and frightened a couple of ducks that quacked and flew up into the air and over the wall. At least, they would be inside, I thought, at least, they would be able to see the secret. When I finally found the entrance, I discovered more mysteries inside. I found the churches that rang the bells and I even found the blood of Christ. Bruges is a place the world forgot and I am still in awe that I found this secret. It was a secret worth discovering.